Radar has its origins in the first half of the 20th century. However, radar level measurement did not come on the scene in use as a continuous level measurement technology until the later part of the 20th century. Radar level measurement is available in both contact and non-contact forms. The contact form of radar level measurement is known as guided wave radar a.k.a. TDR (time domain reflectometry) and the non-contact form of radar level measurement is through-air or open-air radar. The most popular radar level measurement devices available today are those that do not have a sensing element in contact with the target material to be measured, Through-air or open-air radar level measurement has gained popularity in both liquid and bulk solids level measurement. There are two different technology implementations of radar level measurement in the non-contact form, e.g. FMCW and Pulse Radar. Arguments for each radar level measurement technology can be made, successful implementations of each type exist in the marketplace. Pulse radar level measurement uses the time-of-flight of radar energy pulses to measure the distance from the units’ antennae to the material surface. FMCW uses frequency changes as a result of the distance to measure level. Either way both implementations of radar level measurement have their challenges and also success. 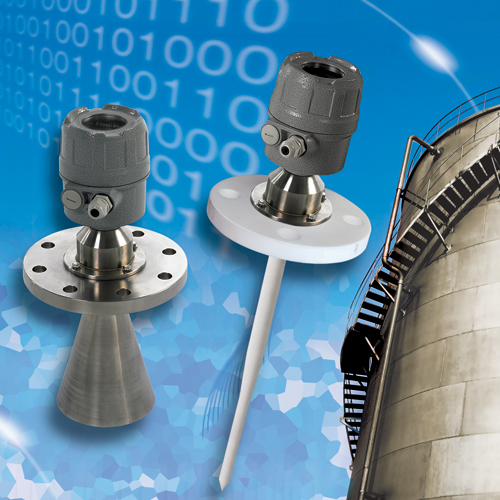 For a further look at a radar level measurement you can visit our JFR series product page or download the JFR series radar level measurement transmitter sales catalog. For more information on the JFR series radar level measurement transmitter product line you can contact us at 815-632-3132.